Image caption Mr McCormack said his skin now felt "like a pork roast"
A New Zealand truck driver who fell on a compressed air hose that pierced his buttock has survived being blown up like a balloon. Steven McCormack had fallen between the cab and the trailer of his truck, breaking the air hose. The nozzle pierced his buttock and began pumping air into his body, which expanded dramatically. As he screamed, Mr McCormack's colleagues turned the air off and laid him on his side, saving his life. The accident happened at Opotiki on the North Island on Saturday. 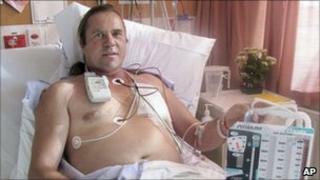 Mr McCormack, who is 48, is still in hospital in the nearest town, Whakatane. "I felt the air rush into my body and I felt like it was going to explode from my foot. "I was blowing up like a football... it felt like I had the bends, like in diving. I had no choice but just to lay there, blowing up like a balloon," he told the local newspaper, the Whakatane Beacon. He said his skin feels "like a pork roast", hard and crackly on the outside but soft underneath. He credits his colleagues, especially Jason Wenham who put him on his side, with saving his life. Mr Wenham, Ross Hustler and Robbie Petersen had lifted Mr McCormack off the brass nozzle which was still stuck in his body, and packed ice around his swollen neck until an ambulance arrived. Doctors inserted a tube into his lungs to drain the fluid and cleared the wound in his buttock using what felt to him like a drill. "That was the most painful part," he said. "It's fair to say he's lucky to be alive, it was a potentially life-threatening situation," a hospital spokeswoman told AFP on Wednesday. Mr McCormack confided that the air was gradually escaping his body in the way that air usually does.